ARLINGTON, Va. – The Washington Capitals have named Jim Johnson the team’s assistant coach, replacing Bob Woods, vice president and general manager George McPhee announced today. Johnson, 49, took over as the head coach of the Norfolk Admirals of the American Hockey League (AHL) at the end of the 2009-10 season, finishing with a record of 15-5-0-2 (.727) in his 22 games behind the bench. Prior to his time with Norfolk, Johnson was an assist coach for the Tampa Bay Lightning during the 2009-10 season. 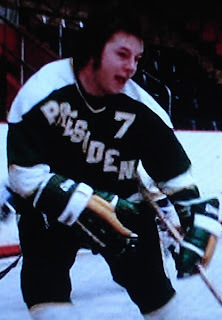 The former defenseman played in 829 NHL games with the Pittsburgh Penguins, Minnesota North Stars, Washington Capitals, Dallas Stars and Phoenix Coyotes from 1985-1998. Johnson tallied 195 career points (29 goals, 166 assists) and 1,197 penalty minutes. The New Hope, Minnesota, native appeared in 121 games with the Capitals from 1993-1996, collecting 19 points (two goals, 17 assists) and 89 penalty minutes. Dale Hunter had one practice and a morning skate to work with his new team. Not much time to turn the team on its rear and start playing like the Washington Capitals should. It was clear that not much changed as the players took the ice and dropped Hunter's coaching debut to the St. Louis Blues and their new head coach Ken Hitchcock 2-1. Nick Backstrom scored the only Caps' goal after a pretty feed from Alex Ovechkin in the first period. But that would be all the offense the Caps could muster as the Blues choked the top lines. Typical Hitchcock-coached team, the Blues stifled the Capitals high powered offense and took advantage of the few chances they did get from some break downs by the Capitals. Matt Hendricks picked probably the best time for a fight early in the third period, but the Caps gained little to no momentum from it. Jason Chimera had a strong game too moving his feet and registering 4 hits. The Blues have been a hot team of late since their coaching change. The Caps are still in slump mode and it showed for most of the game. The Caps had a weak second period mustering only 6 shots on Halak. Granted the Caps were forced to kill off a double minor by Troy Brouwer but the Caps were only able to get 19 shots total on Jaroslav Halak. While it's not that great of a measuring stick on how Dale Hunter will ultimately coach his team, it does show the work that is cut out for him. With just one more day of practice before Conference rival Penguins are at the phone booth, Hunter is going try and solve the offensive woes of the Caps while keeping an eye on the defensive side of the puck. Tomas Vokoun registered his first point of the season with an assist on the Backstrom goal. He was credited with the secondary assist. The ice times for each player was pretty consistent. No player averaged more that :50 seconds per shift, and only Troy Brouwer was the lowest at :37 seconds per shift (mostly due to his double minor in the second period). Both John Erskine and Marcus Johansson left the game with injuries and both returned before the end of the game. With the coaching change for the Washington Capitals, Bruce Boudreau out and Dale Hunter in, a lot of things will change as this team struggles to find identity. Lately there has been a lot of talk lately of Alex Ovechkin's under performance over the past two years as a part of the Caps' failures. Some draw that under-achievement to the C that rests on the wingers left shoulder. In some ways, I believe that to be true. The expectation level for the one of the league's most captivating forwards in the modern NHL has been an awful burden on the 26 year old. Ovechkin not only puts the pressure of a NHL team that was picked by some to win the Cup this year, but of his country's duties and the up coming Olympics in Sochi in 2014. The pressure Ovi puts on himself to win a gold medal and win the Stanley Cup, not to mention be the leader of his team, seems be too much to bear. I do think that it is affecting his play on the ice night in and night out. Let's be clear, this is Ovechkin's team. It was built around him from the moment the Caps picked him in 2004. Nick Backstrom was brought in to support him, the Caps have drafted grinders to help his line produce and the young guns are all centered around Ovechkin. It was the logical choice to make him captain when Chris Clark was traded to Columbus leaving the office open. At first Ovechkin reveled in the spotlight. But of late, it seems to be more of a hindrance than an asset. 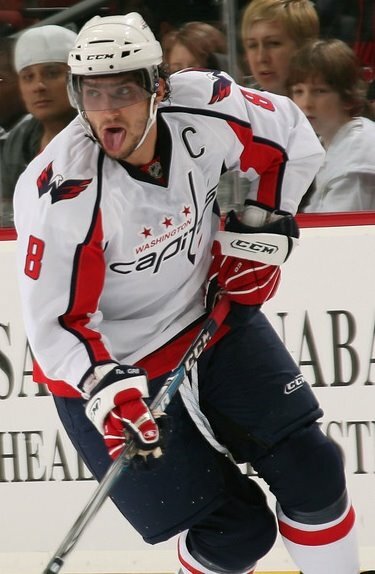 With the changes the Caps have made behind the bench, maybe one of the first duties is to get Ovechkin back into his predator-like offensive mode. One of the ways to do that is just let him be a player. Not a captain, not a country's only hope for a gold medal, not a city's savior for the Cup, just a player. Just let him play. When the Capitals played like the low expectation team with nothing to lose, they seemed to play their best. Now with expectations through the roof, it has become more of a burden on the team than some thing to inspire them to play like champions. 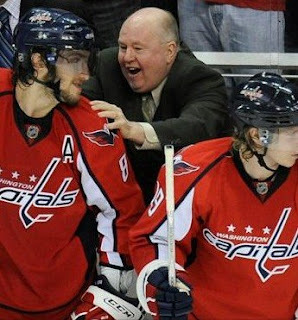 The run to the playoffs when Boudreau was first hired is a perfect example of how low expectations seemed to inspire the Capitals to push them further. Just let him play, when Ovechkin isn't worried about how badly his team needs him make the perfect play, the Capitals win. He is better when he is getting 40 shots a game and playing for the fun of it, rather than treating the game like a job where all eyes are bearing down on him. He relished in rivalries, was spectacular for the cameras on HNIC, he played best when he just played the game. Does that mean stripping him of the C? That locker room the Capitals have is full of leaders that don't wear a letter on their shoulder. Ovi doesn't need that C to be great, he doesn't need the responsibility of taking ownership of the teams failures either. He just needs to play the game. If that means stripping the C to make a point, I wouldn't be all that surprised. ARLINGTON, Va. – The Washington Capitals have named Dale Hunter the team’s head coach, replacing Bruce Boudreau, vice president and general manager George McPhee announced today. Hunter, 51, becomes the 15th coach in Washington Capitals history and will make his debut behind the bench tomorrow as the Capitals host the St. Louis Blues at Verizon Center. Hunter helped the London Knights of the Ontario Hockey League (OHL) win their first Memorial Cup Championship in 2004-05 and is the fastest head coach in OHL history to record 300 and 400 career wins. 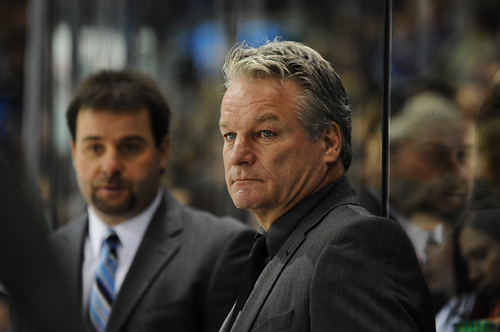 The Petrolia, Ont., native owns the highest winning percentage in league history with a record of 451-189-23-24 (.691) in his 11 seasons behind the bench for London and was the 2003-04 winner of the Brian Kilrea Canadian Hockey League (CHL) Coach of the Year. Hunter played 19 seasons in the NHL from 1980-99, appearing in 1,407 games and collecting 1,020 points (323 goals, 697 assists) along with 3,565 penalty minutes with Quebec, Washington and Colorado. Hunter is one of just four players to have their numbers retired by the Washington Capitals as his No. 32 was retired by the team on March 11, 2000. Hunter captained the Capitals from the 1994-95 season until the 1998-99 season and was named to the NHL All-Star Team in 1997. He played in 872 games for the Capitals from 1987-99 and compiled 556 points (181 goals, 375 goals) and 2,003 penalty minutes. Hunter ranks first all-time in Capitals’ history in penalty minutes, fourth in games played, tied for ninth in goals and third in assists. His 100 career playoff games with the Capitals rank tied for first in team history while his 72 points and 47 assists both lead the franchise. Hunter is the only player in NHL history to record more than 1,000 points and 3,000 penalty minutes. He ranks second in NHL history in penalty minutes, 53rd in assists and 73rd all-time in points and his 186 playoff games rank tied for 23rd all-time. He was originally drafted by the Quebec Nordiques in the second round (41st overall) of the 1979 NHL Entry Draft. This season the Knights lead the OHL with a 20-5-0-1 record and 41 points. Hunter earned his 450th career win on Saturday, Nov. 26 in a 7-2 win over Erie. The Knights are currently the top-ranked team in the CHL and have been ranked No. 1 for seven of the 10 weeks this season and each of the past six weeks (CHL’s Top 10 teams are selected by a panel of National Hockey League scouts). During his time in London, Hunter has coached current Capitals defensemen John Carlson and Dennis Wideman and has worked with numerous other current NHL players such as Rick Nash, Corey Perry, Patrick Kane and John Tavares. London has won 50 or more games three times and finished first in the OHL four times under Hunter, including a CHL record-setting season in 2004-05 when the Knights finished with a record of 59-7-2-0 and went 20-2-0-0 in the playoffs on the way to the first Memorial Cup championship in London history. You hear that noise? That is the sound of Bruce Boudreau's job security hitting the rocks. The Capitals can not seem to right the ship as they fall hard to the limping Buffalo Sabres 5-1. Facing a team mainly consisting of rookies due to nine injured players out of their normal lineup, the Capitals couldn't even muster a forecheck on the young defenders. Add a few soft goals and some poor play by the defense, it made for a rough night for the away team. Instead of writing this one out, lets just go to some pointers. Jason Chimera is the best thing that has happened to the Capitals in the month of November. A beauty of a penalty shot he earned by moving his feet and using that great speed of his. His shot beat Buffalo's goaltender Jhonas Enroth over his right shoulder and got stuck in the net. The awesome part of the whole thing was to see Buffalo fans that cheered thinking he didn't score, oh but yes, he did. Tomas Vokoun is the biggest buzzkill the Capitals have right now. After a cutting into a 2-0 lead with Chimera's penalty shot goal, the Caps looked poised to get back into the game. But Vokoun let in a softie and it killed whatever momentum the Caps had to that point. It's clear to me that one of two things are falling apart on the Capitals. Either their offensive strategy is not working, or the players are not executing. Either way that points to a clear coaching conundrum. While I don't think Boudreau is entirely at fault, but a coaching shake up (head or assistants) could be in the near future. The Sabres followed the Rangers strategy to put pressure on the back line. With the effective forecheck they executed, it lead to a slew of chances and kept the Caps chasing the Sabres. The Capitals definitely felt the effects of playing the day before. With tired legs and a shortened bench, the Caps legs wore out on them. In the third they were pretty worthless. Roman Hamrlik has had a terrible November. He was a -3 in this game and hasn't been the solid rock on the back end the Caps were hoping for when they signed him. When things go south for the Capitals, it usually goes bad for the Caps top lines. Alex Ovechkin and Nick Backstrom were held with out a point and were a -4 to finish off the night. The ineptitude of the top line is a problem, especially when the Caps seem to need them to produce. The teams the Caps face over the next few nights don't get any easier. Even though they return to the phone booth, they face the St. Louis Blues and then the Pittsburgh Penguins. The Caps will have to nail down some kind of consistency and a bit more competitiveness. If you thought getting a face full of pepper spray on "Black Friday" because you thought you might miss out on a smoking hot deal was hard to swallow, how about a lackluster performance by the Capitals against the New York Rangers? Out-hustled, out-goaltended, out-witted, out-played, just about out everything as the Rangers embarrass the Capitals at home 6-3. There were some silver lining to said embarrassment. John Carlson had a pretty good day with a goal and an assist. The Caps were down 3-1 when Carlson scored a scorcher on the power play beating Henrik Lundqvist's glove and hit the inside of the far post and in. Troy Brouwer also had a goal himself scoring off the Carlson point shot. Alex Ovechkin looked like the Ovi of old with a streak up the left side, used Dan Girardi as a screen, and smoked it over the shoulder of Lundqvist. But the Caps played with fire allow the Rangers five power play chances and the Ranger built momentum off of the extra man opportunities. With a little hard work and some great forechecking ability, the Rangers were able to jump to a 3-0 lead in the second period. To that point, the Capitals didn't look half bad, playing solid in their zone and getting chances on turn overs in the neutral zone. The PK has been better, but it did allow a goal at the worst time. Add some standing around in the defensive zone and the Caps just looked like they were chasing the play all game long. Stark contrast to the 4-3 winner against the Jets two nights before. The Caps' power play was able to convert one, and made the game a bit more competitive, but the Caps just got out-played with a late second period goal and a poorly covered transition game that put the Rangers up for good. A few of the bright points were Joel Ward's tough work in the neutral zone. It led to a few chances early, but the lack of an elevator on Ward's shot made it almost too easy for Lundqvist who is so good down low. Dmitry Orlov had another solid game himself. Since being called up he has been a hitting machine and this evening was no different. Jason Chimera also played well despite the score. Denis Wideman and Marcus Johansson both had tough outings in contrast. Both were a -3 and MoJo had 4 giveaways, one that lead directly to a goal, and Wideman was credited with 5 giveaways. Alex Semin was a bit of a enigma in this game. He did make a few good plays, but he took another hooking minor and went for the puck instead of taking his man on a back check that lead to the Brad Richards' goal. Another player that didn't seem to have the heart tonight was Cody Eakin who has the wheels, but I have yet to see them in action at this level yet. The Capitals need to quickly put this one in the past as they travel up to Buffalo to face the Sabres tomorrow night. The Caps continued taking the body registering 40 hits on the Rangers. Ovechkin had 8 hits himself including one that led to the Capitals first goal of the game. He took the body on Marion Gaborik allowing Nick Backtrom to pick up the loose puck and find Carlson in the high slot. Carlson's shot snuck through Lundqvist and Brouwer made the slam dunk. Zack Bogosian will not face any supplemental discipline for his hit on Cody Eakin. Although Eakin was hit in the head, Bogosian lead with the shoulder and didn't make any motion as if he was targeting the head. Playing for Winnipeg probably helps too. Mathieu Perreault was the healthy scratch. Ondrej Pavelec has been nothing short of a brick wall against the Capitals of late. But the Caps finally solve the pesky goaltender and put forth an inspired effort to earn a 4-3 overtime win against divisional foe the Winnipeg Jets. Jason Chimera had himself a game scoring a pair of goals (his seventh and eighth of the season) including the game winner 1:52 into the overtime period. He could have easily scored a pair more but some outstanding goaltending by Pavelec kept Chimera from scoring a few more. Alex Semin scored his fifth of the year after getting a beautiful feed from a hustling Alex Ovechkin. Birthday boy Nick Backtrom also added a tally to round out the scoring for the Capitals. Unlike games before, the Caps seemed to put forth a better effort this game. They were moving their feet, beating Jets to loose pucks and making the defensive effort to block shots. Rookie Dmitry Orlov might have had the hit of the game in the second period when he laid a spectacular hip check on the speedy Blake Wheeler. That set off a flurry of hits and physical play from both teams that added to the intrigue of the game. The Capitals would outhit the Jets 35 to 27. The Caps power play only had three chances to work. It did lead to a slew of chances, but the Caps could not convert on the man advantage. While the power play stumbled, the penalty kill was fantastic killing off two minor penalties including a 1:20 five on three with Brooks Laich sans stick for a majority of it. Tomas Vokoun was at times spectacular, while at other times looked a bit slow to react to the play. While two of the goals came off of some lucky bounces for the Jets, the tying goal was savable. Wheeler's pass to Bryan Little seemed to freeze Vokoun up and he was late to get over to cover the shot by Little. The goal by the Jets was preceded by a waived goal by the Caps just moments before. After sitting a game, Semin roared back into the lineup. Not only did he start the scoring with a pretty slapper off of a great feed from Ovechkin, but he did not get called for stick infraction. In part it was due to Semin moving his feet and trying not to do too much with his stick (other than shooting pucks on net and curl and drags). Caps win their second straight after struggling to win games losing 6 of the previous 7. Both games ended with the scores 4-3. Cody Eakin had a scare as the hitting escalated in the second period. He took a high hit to the head from Ron Hainsey that looked very close to a targeted hit to the head. While the Caps held the lead, Eakin's ice time diminished. Eric Fehr returned to Washington to face his former team as a Jet. He was a -1 with one shot on net and one blocked shot. Backstrom scored on his birthday. He is 24. Rookie defenseman Orlov nearly had a second hip check that would have sent another Jet flying, but this time it only jettisoned Kane's stick into the crowd. A fan caught the stick, but was forced to give the stick back in return for a game puck as seen here. Lame.